Once upon a time, I think it was in 2002, my friend and colleague Alain Maury told me that in the storage room of the house he was renting he had found an old radio. He knew that I restored and collected radios, so he asked me if I would be interested in yet another one. He also asked the house owner if the radio had any future prospects, and got permission to dispose of it. When I went to pick it up, the surprise was on my side: I had expected "any" old radio, but finding an Atwater Kent cathedral from 1934 was certainly beyond my expectations! This is the first Atwater Kent in my collection, and I had been wanting one for years! 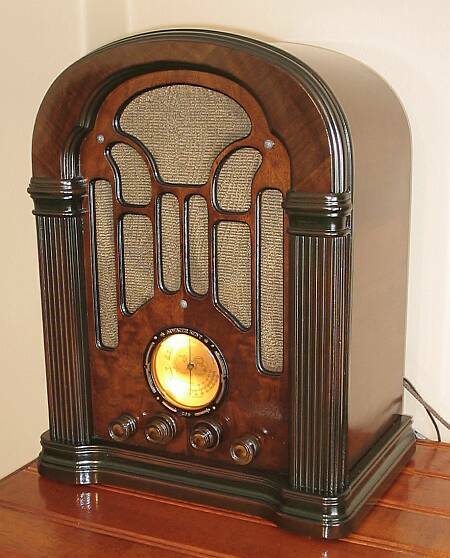 The radio was in somewhat poor condition - little finish remaining, obvious signs of having been scraped with a sharp object during an earlier refinishing attempt, the veneer delaminating but almost complete, all knobs missing, and the electronics had been drastically modified. Still, it looked very restorable, but would take some work. I brought it home and decided to give it the very best treatment I could. 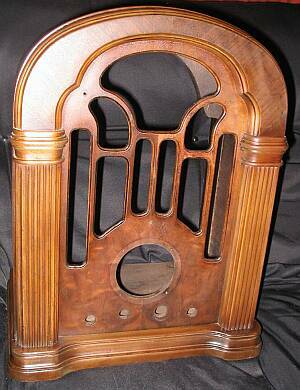 Just in case you are wondering: Of course, this photo shows the radio after restoration! This is the type label attached to the inside of the cabinet. The "X" stands for "export" version. The radio was made specifically for countries with 220V mains distribution. 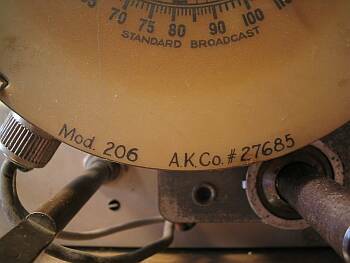 There was also a 206 model without any letter, which was the same radio but with the transformer primary wound for 110V. And there was also a quite different version, the 206-D, which was for 110V DC. Instead of a rectifier tube, that one had a second output tube, necessary to achieve enough output power at the low supply voltage of 110V. This radio is a superheterodyne using 2.5 Volt tubes. There is a 58 tube used as RF preamplifier, a 2A7 converter, a 58 IF amplifier, a 2A6 detector and audio preamplifier, a 2A5 power amplifier, and a type 80 rectifier. A transformer delivers 5V at 2A for the filament of the rectifier, 2.5V at about 6A for the filaments of the other tubes and the dial lamps, and a high voltage for the plate supply. But my specimen was lacking this transformer! There were just the mounting holes, and black marks where the transformer had burned. Whoever repaired this set when the transformer failed, chose to modify the radio for transformerless operation. None of the original tubes were there. Instead, the tubes were 6D6 - 6A7 - 6D6 - 75 - 43 - 25Z5, with the filaments in series, fed from 220V through a dropping resistor that dissipated close to 50 Watt, and the chassis live at line voltage! I decided to restore this radio to its original circuit, if I managed to get the tubes. Fellow collector Renato Menare supported me in this decision, and he was the one who provided most of the tubes, and many other parts too! My own collection could provide only two of the six tubes I needed. This radio is full of numbers. The label is 28188. I guess that's what counts as serial number for the whole radio. The dial has its part number carefully hand-written on the otherwise type-set dial. There are part numbers on the speaker, the cabinet, the chassis, and many of the components. The 206 covers three bands. The standard broadcast band, and a short wave band spanning 5.9 to 15.5 MHz, are the main bands, and the circuit provides adjustments to achieve good performance and dial calibration on them. The range between the two, 1.6 to 5.9 MHz, is provided as a third band, but without adjustments and thus with lower performance. The famous Atwater Kent quality shows in every detail. This is a picture of the backside of the stamped brass dial escutcheon. Not only are the brand name, model number and decorative figures formed in great precision, but also there is a texture stamped into the metal. Looking very closely, I discovered a very tiny, but crisp and precise "WHITEHEAD - HOAG" there. Was that a contractor stamping these pieces, or what? Any info is welcome. UPDATE! Pete Olin wrote with the following piece of information: W&H was a major stamper of small metal parts, especially campaign buttons back to the 1890's. So, Atwater Kent indeed outsourced the stamping of these dials, contrary to the urban myth that this brand build every part in house! The texture appears on both sides of the metal. But the small text is only on the backside, without any traces on the front. They must have used enormous pressure to stamp the metal in this way! 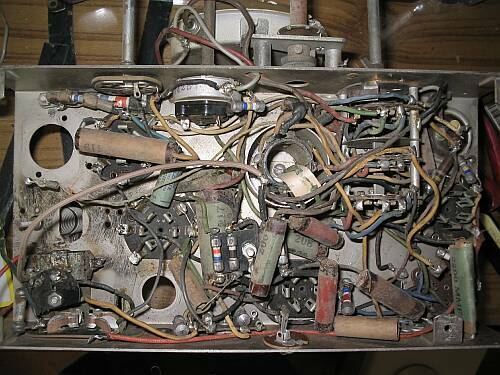 When I had the tubes, I was ready to proceed and turn the radio back to its original circuit. This picture shows the underside of the chassis after I removed the non-original parts and wiring used for the modification. I did not remove the phono connector. It is non-original too, and was riveted to the chassis but never connected! The lugs show no signs of solder. I chose to leave it in place because a non-original phono connector looks better than a non-original empty hole in the chassis! From this point, I moved slowly and went over the circuit from the antenna input to the output and power supply, component by component, wire by wire. Every part was checked to make sure it was in acceptable condition, and correctly wired. Several bad parts were found, mostly leaky paper capacitors and severely value-shifted resistors. Some resistors had grown up to 500% in their resistance, and one of them was open. 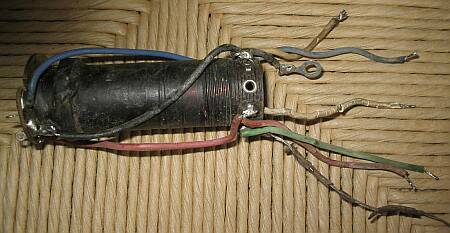 Of course, all electrolytic capacitors were dry, including a non-original one fitted probably in the 1960s. The funny thing is that the standard color code was in ample use by 1934. Only that AK chose to roll their own instead! AK made paper capacitors in inductive and non-inductive construction. Of the examples cited above, the 104 and 217 are non-inductive, while the 204 is inductive. And there are special gadgets: The 419 used in this radio is a special "tone condenser". It has two sections, of 0.004 and 0.001µF, with carefully controlled inductance to yield just the right sound quality! Replacing it by two standard, modern capacitors totally messes up this radio's beautiful sound! It hides in the skin of a paper capacitor, but functionally it's a dual LC circuit! This is an RF coil, with trimmers mounted on its top. I had to remove these coils because their connection wires had cracked insulation, so bad that they shorted out everywhere. Interestingly, some colors of rubber insulation degraded much more than others. Throughout the radio, the brown rubber is totally brittle, while the blue and red are much better. Probably the kind of dye affected the stability of the rubber. Also, the wires are in much better condition in all those places where it doesn't get too hot, and where there is little air circulation. It looks like strong ventilation brings in too much oxygen, and the rubber gets oxidized! I had to replace most of the radio's wiring. In the course of the reconstruction of this radio, a power transformer had to be custom-made. I do have a simple winding machine, which was given to me by a ham radio friend, Enrique Villanueva, many years ago when I was a student. This machine has proven enormously useful, many times! But first I had to get a suitable core. The space available is quite tight for a transformer of this power rating (80 Watt), so I wanted to use the biggest one that would fit. I asked several friends for old transformers in the suitable range of sizes. Romelio Gajardo was the "winner", giving me an old 220-110V autotransformer that had almost exactly the optimal size. I took it apart, and rewound it for this radio. The filament requirements were clear enough. But I had my doubts with the high voltage. The service manual for this radio, however complete it might be in most regards, does not give the voltage of the transformer's high voltage winding! So I had to start from the voltages given for the tube plates, add the drop for the speaker field coil, add an estimated drop in the rectifier tube, consider the capacitor filtering effect, the wire resistance, and so I arrived at 2 x 280V. I wound the transformer for this voltage, and the radio is playing great with it. But the voltages ended up a tad lower than those given on the diagram - the rectifier drops more voltage than expected! Winding the transformer for 300V would have been better. But 280V is close enough. I won't remake the transformer for that small difference! It has a total of 3580 turns of wire, which even using a machine take some time to wind! 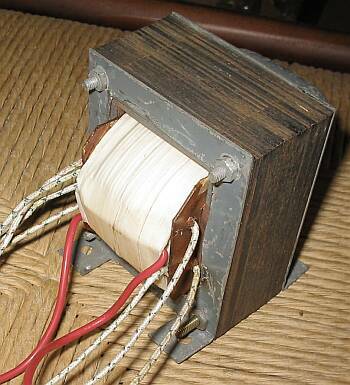 After making this photo, the transformer was painted black With the light yellow paper insulation, it looks quite antique! The mechanics also required quite a bit of work. This detail shows the drive mechanism of the variable capacitor. 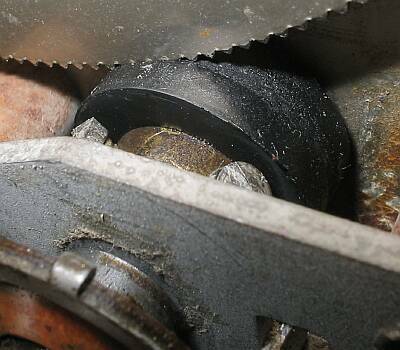 There is a vernier drive, with a rubber roller connecting to a softly dented wheel. 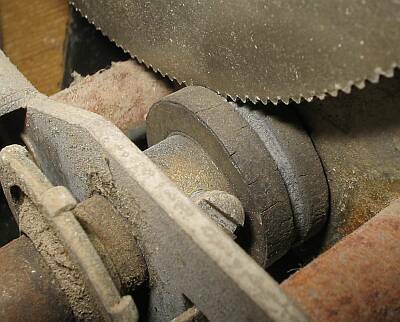 And this roller was dry, brittle, and worn, so much so that it slipped without even trying to engage with the teeth! I considered just wrapping it in something, but after repairing the vernier drive I caught flight, and opted for the correct way to repair the roller. I went to a store that sells all sorts of rubber pieces, and bought a door stopper that was big enough to put in my lathe. I deep-froze it using freezing spray, and turned it to slightly larger size than what the roller needs to be. Then I put the brass sleeve in the lathe, ripped off the old bad rubber, cleaned the rubber mounting surface with the lathe. Then I vulcanized the new rubber piece onto the brass sleeve, with heat and sulfur. When that was done, I again froze the rubber, turned it down to the exact size, and then gave it a smooth surface by slightly melting it with a grinding stone in a Dremel tool. The result is just perfect! It works as it should, and several people who have seen it just don't want to believe that this part isn't an original Atwater Kent spare part! 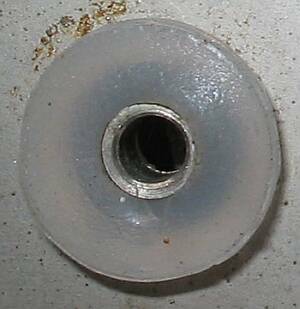 More rubbery trouble: The soft, slotted rubber washers, which are used in almost all radios to keep chassis vibration away from the variable capacitor, had decomposed into a somewhat crystallized, rosin-like goo. I could find no rubber that's soft enough for this purpose, and in most old radios these washers need replacing. So I decided to solve the problem once for all time! Here you can see the new washer. It's made from silicone caulk. This material has precisely the right properties to be used in this application! Using my lathe, I turned some molds from polyethylene, which does not adhere to silicone. Then it was just a matter of pouring silicone, letting it set, take the new washer out of the mold, and pour silicone again. In a matter of some days, I made all the washers I will ever need! Renato also got some, since he too has radios that need new rubbers. The radio came with a plastic power cord from the 1960s or so. Ugly! I decided to give it a new cord, a nice, fabric covered and brown one. But the only fabric covered power cord I could find was white with black dots! So I bought that, and dyed it with walnut extract. It came out quite decent, but not perfect. Next time I do that, I will use a different dye, trying to make it better! This is the filament test! At last, the chassis was ready, reconstructed component by component. I let the filaments run for some hours, to warm up the tubes and activate the getters, so that any residual gas would be adsorbed before applying high voltage. The dial lamps in this photo are 6.3V ones. They light as dimly as the tube filaments. I later found the correct 2.5V lamps. Fortunately the problem was just with the connection of the primary winding to the terminal. I was able to dig into the transformer insulation and fish out the tiny wire, reconnecting it. Then I tried my radio, and it worked right away! It was a surprise to find that despite my extensive disassembly, change of parts, wiring, and all, the radio actually held its alignment well enough to work right away! But then I noticed that the news that were coming out of the speaker were not local ones, and that the lady talking did definitely have a non-Chilean accent. The next revelation was that I was listening to a Spanish radio station! The band switch just happened to be on short wave and this resurrected radio was receiving Europe on a 1 meter long wire antenna, without even having been realigned! WOW! Even so, of course I realigned the set. The broadcast band dial was a bit off the truth, and after 70 years and a complete reconstruction, alignment is sure to be non-optimal. My first surprise was to find the IF adjusted to 455kHz! That was the work of a previous repairer. He had then tried to bring the dial into alignment by brutally tightening some trimmers, to no avail, because this radio is designed for an IF of 472.5kHz! I realigned the IF transformers to the correct frequency, and then the rest of the adjustments were easy to do, with all the trimmers ending up somewhere near midrange. As I aligned the set, it really came to life! This thing is so sensitive, and has such good AGC action, that on a 1 meter long antenna wire laid on the bench, it receives international broadcast stations at the same volume control setting as a local station! That kind of performance was not usual until many years later. But the sound quality was very poor. 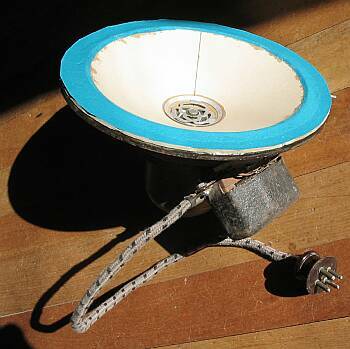 The speaker was scratchy, which was no wonder, considering how the cone looked. I tried re-centering it, but there was no way. 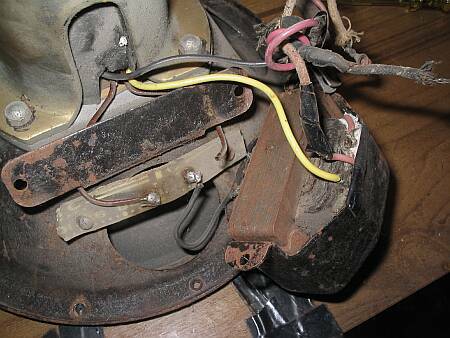 The voice coil was bent, and always scraped at some place, regardless of how I pushed and shifted it. The coil was non-original. The cone had several patched rips, and some unpatched ones. The spider was totally deformed, ending up in a position that left it no motion range. 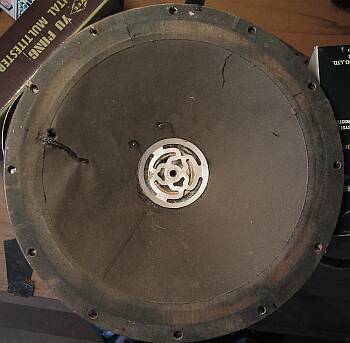 After pondering the possibilities, I decided, with quite some pain in my poor suffering heart, to part with the original Atwater Kent cone, and re-cone this speaker. I made the cone from the same stiff paper I use to print my business cards. I made a polyethylene former for the voice coil, using the lathe, and made the coil, using an old QSL card as material for the support. Fortunately I had just the right size of wire at hand. The two layers of wire, measuring as much as the width of the magnet poles, gave me precisely the 3.2 Ohm specified for this speaker. The next smaller gauge of wire would have given close to 5 Ohm, while the next larger one would be too thick to fit the gap! 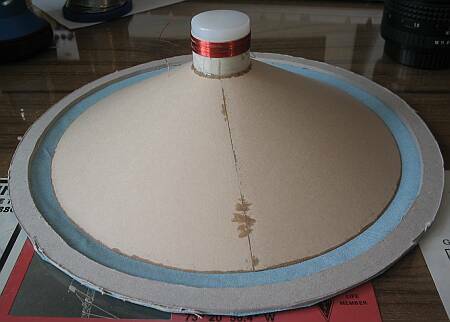 I first glued the fabric to the cardboard ring, then the cone to the fabric, then the coil to the cone. During all this gluing, painstaking care was applied to keep everything well aligned. The polyethylene former was removed only after all gluing was done, so it could keep the coil perfectly straight while gluing. Here is the rebuilt speaker! Shudder, those colors! Originally I had the noble intention of spraying it black, but then I decided against this. The paint might stiffen the cone, making it sound tinny, and anyway these colors aren't visible when the radio is assembled. Instead, I exerted more care, colorwise, when replacing the speaker cable. The original was beyond repair, with all the insulation cracked, and the conductors shorted. I used plastic-insulated wires and sheathed them in the fabric removed from a piece of power cord, dyed brown with walnut extract. With the repaired speaker, the radio was now sounding good! All the scratchiness was gone. It was time to move to woodworking. My radio had no knobs. But Renato has an AK 206-D, which despite not being complete, does have most of its original knobs! I borrowed his knobs, and copied them on the lathe, making all the knobs my radio needed, and those that were missing on his. The original knobs were made of a dark wood. It might be walnut, but I don't know. Anyway, I don't have any dark wood like that available here. Whatever I used, I would have to dye it. Looking around for something suitable, my eye fell on the humble broomstick in the corner of my workshop. That broomstick was really begging me for the honor of donating part of itself to the Atwater Kent legend! I grabbed the hacksaw... A minute later the broomstick was 20 cm shorter, and my lathe went to work on the donated organ, transforming it into one and a half sets of accurately original Atwater Kent radio knobs! The knobs got brass inserts with set screws. 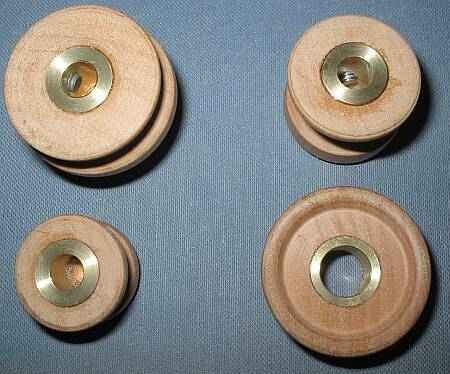 Of the original AK knobs, only the two concentric ones on the tuning shaft have set screws, while the others are simply pushed on. 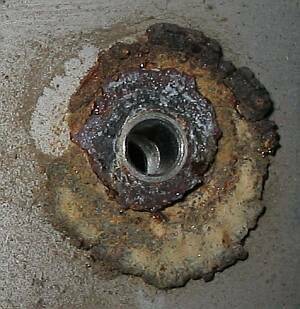 But with the heavily rusted shafts of my radio, push-on knobs weren't a good idea. I fitted all the new knobs with set screws. That's also easier to make than spring-loaded inserts. This photo shows one each of all four different knobs this radio uses. The band switch and tone switch each use one like that in the upper right. The tuning shaft is double concentric, for the vernier drive, and uses the lower right knob for fast tuning and the lower left one on top of it for fine tuning. The volume control, for symmetry, uses a single knob in the same shape as the two tuning knobs combined. What a fancy way of maintaining symmetry! It shows the Atwater Kent philosophy to perfection! Here you can see the cabinet, more or less as I got it. It's upside down here, in the process of being re-glued. The entire lower section had come apart, and every single layer of plywood had complete freedom. The whole box was a very weak affair! I had to wiggle glue into each of the narrow slits between each layer of plywood and its neighbors, and then compress the sandwich to re-glue it all. Wooden blocks were wrapped in kitchen plastic and used as pressure pads. The plastic won't bind to the glue. Note the red paint marks around the hole for the bandswitch. This radio must have had a forgetful user. He painted the positions for long and short wave in red paint over the radio! After re-gluing all loose parts, and replacing a section of veneer that was missing from the back of the rim, the detective work started. 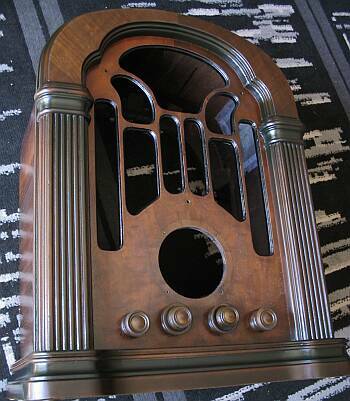 Too often I have refinished radios, only to find that they ended up beautiful, but far from their original look. With this nice radio, I absolutely wanted to make it look as original as I can. But that isn't easy! Look here, for example. The backside is painted black, no doubt about that. 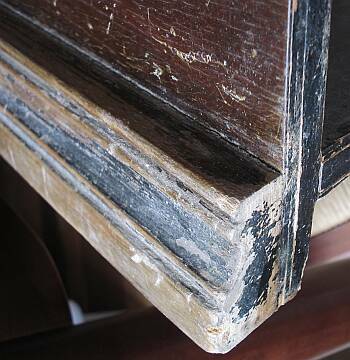 The stripe along the molding looks black too, while the rest is walnut brown, except where no finish is left. So, was the black stripe made with the same paint used on the back? Apparently not: The paint on the back dissolves very quickly in lacquer thinner, while the black stripe was very slow to dissolve! Clearly, the black stuff in the stripe is different from the brown further up. But is it a different lacquer, paint, or just a thicker layer of lacquer? And what dye did they use? Note the unglued plywood and veneer. This photo was taken before re-gluing this. This is a detail of the left column. It looks like it had black dye in most of it, but brown at the sides (left side here). All of that remains only in the low areas; at the raised areas the finish was totally worn off. Later, someone painted over it all, with a yellowish brittle stuff which I like to call cacalaca. Those of you who understand Spanish will know what I mean! I took samples from various parts of the finish, analyzed them, looked at them under different lights... and it was puzzling at best. The idea I got is that these guys used Bitumen of Judea as a dye, and applied it both as a paste filler, probably by hand with a rubbing pad, and also mixed with the lacquer that was sprayed on. 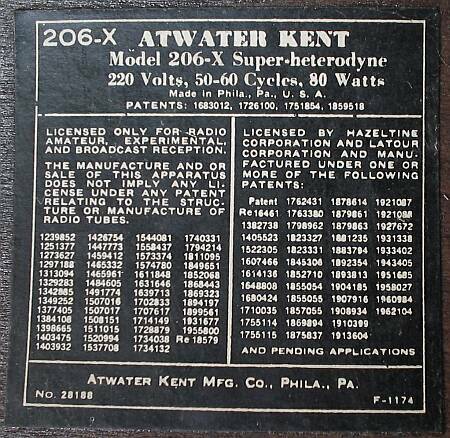 If any of my dear readers knows what materials were used in the Atwater Kent factory, and on old radios in general, I would love to hear about it! Anyway, the finish had to come off. It was much to unevenly damaged to even think about saving it. I applied a mix of solvents, and slowly the stuff came off. I discovered that the radio had been painted over at least two times, apparently one time with cacalaca and the other time with a modern varnish. One of the painters had tried to remove the dark finish, scraping parts of it away with a sharp tool, and leaving the rest. It looked horrible. The other painter had just brushed varnish over everything, even the escutcheon and the dial window! Fortunately, the grille cloth escaped his brush. With lots of patience and an activated charcoal respirator, I dissolved all that stuff and cleaned it away, with rags, paper towels, and plastic tools. Under the very bad finish was an almost perfect wood surface. The veneer on the sides and top was perfect except for one small notch. The veneer on front hat a few dents, but they came out beautifully with water. 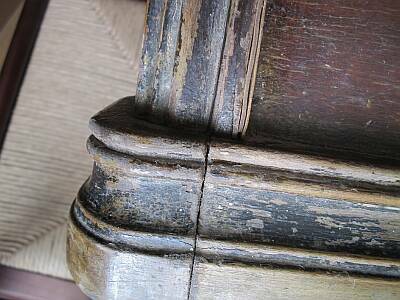 The moldings on the sides were heavily injured: Someone had driven large nails to them, in diagonal, to fix the radio to the desk! Either he used it on a boat, or he was very afraid of thieves! I had to fill the nail holes with putty. The columns were somewhat damaged from impact of assorted objects. I reconstructed the worst areas with putty, and left the rest for the paste filler. The moldings on the sides and on the front are made from different kinds of wood. The one on front is much better quality! This makes clear that this cabinet was intended from the start to be finished in a quite dark tone, the only way to disguise the different sorts of wood. The next step was paste-filling the wood. 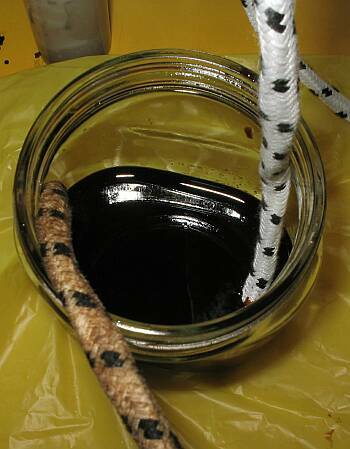 I prepared a filler from standard, colorless wood filler, mixed with a considerable amount of Bitumen of Judea. It produces a tarry black paste that beautifully fills the pores of the wood with an almost black tone, while giving a slightly more reddish than walnut color to the rest of the surface. Then I smoothened the surface using very fine steel wool. The wood filler is formulated to be easy to sand away, and leaves the wood as smooth as baby skin. This is very necessary, because the walnut veneer has large pores, and the side moldings are made of a cheap wood that is very coarse. But sandpaper is too coarse a tool here! The steel wool is just right. It also gets better into the corners and the shape of the columns. This photo shows the cabinet after smoothing it. I have seen many people who reach this stage, say "wow, that's beautiful", spray on a coat of clear lacquer, and assemble the radio. 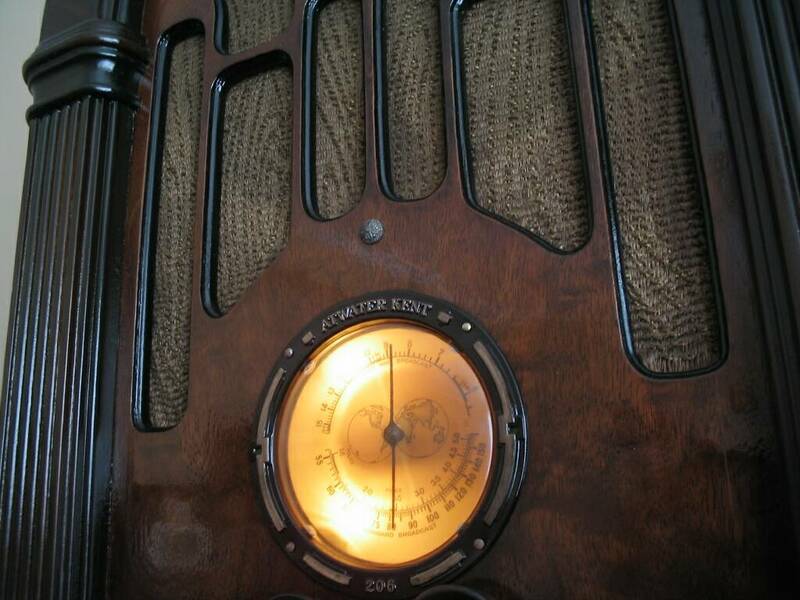 The web is full of such improperly restored radios! 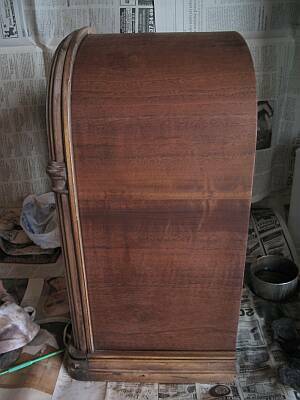 The next step in a correct restoration is staining. Finally I found a walnut stain that can be dissolved in lacquer thinner. I used this stuff to dye some lacquer, and sprayed several layers of it, masking areas as required, to get all the colors as close as possible to the original. While working, I used calibrated photos of my radio before stripping, of Renato's radio, and some photos which I found on the web, showing unrestored radios of this and other models, which come in the same cabinet. After lots of work, I think I have come rather close to the original colors! The knobs were soaked in walnut extract, then given the same treatment as the cabinet, starting from the paste filling step. 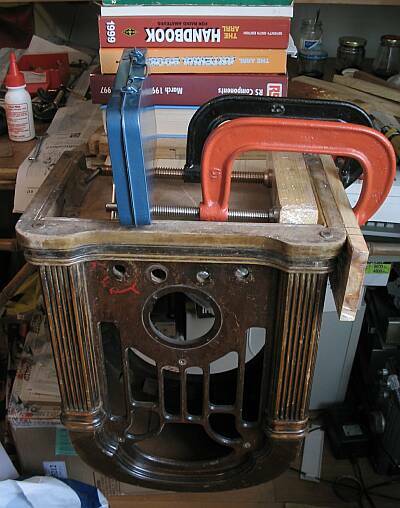 This photo shows the radio in its final colors, before spraying on a few dozen thin coats of clear lacquer, which are necessary to give it a hard, abrasion-resistant surface. 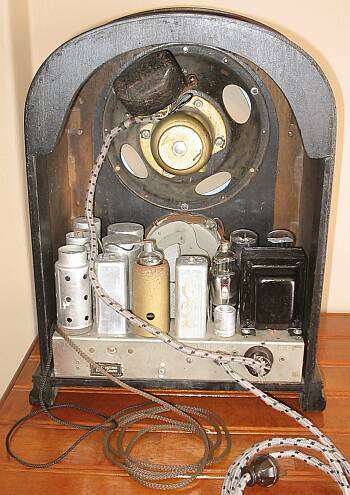 And here is the completely restored radio! But I had to do a few more things, easy things really, before reaching this stage. One was restoring the escutcheon and crystal. 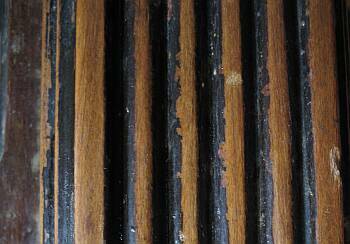 Some earlier "restorer" had brushed varnish over both. The varnish had attacked the celluloid window, and glued everything together. I separated the window from the frame by mechanical means, soaked the frame in paint remover, and polished the window with 3M polishing compound, medium grade first, then fine grade. It came out good enough, if not perfect, and certainly better than replacing it. The brass escutcheon apparently was originally stained black by a chemical process. Someone later scraped away most of the black, probably thinking the escutcheon was originally bright metal! I had to give it back its color. But chemical stains work by attacking the metal. Fine, in a well controlled factory process, but to restore an antique I prefer something that's reversible if it goes wrong! So I sprayed it with black paint, then cleaned the paint off the raised areas, and then sprayed it with clear lacquer for protection. Using natural walnut extract for the power cord seems to have been a bad idea - in this photo it looks too light! But in natura it looks quite good. Anyway, next time I will use a stronger dye. Note the power plug. It's courtesy of Renato, once again! I don't have a guarantee that it is like the original this radio had, but it belongs roughly into the time, and is US-made for export. The grille cloth was mechanically in quite good condition, only the lower ends were frayed, because the earlier restorers didn't bother to fix the backing to the cabinet after putting the cloth and speaker back in. So the cloth flapped with the vibration of the speaker, and frayed. But you have to look very closely to notice that, so I don't consider it a problem. The bad thing with this cloth was its color: It had faded so severely that it ended up almost white! The radio must have spent a long time in the sun. The areas protected by wood had a very much darker color, which I assume is the one the cloth should have. 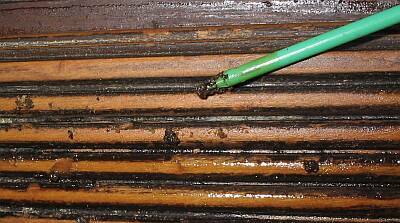 My solution to the problem was spraying the cloth with highly diluted Bitumen of Judea. It nicely gave the cloth a color that's reasonably close to the original, complete with some of its sheen. The cloth is made of two different kinds of fibers, which accept the color differently, so even the texture of the cloth was recovered! And since these are natural fibers, using lacquer thinner instead of water to carry the dye avoids shrinkage and dulling of the cloth. This rejuvenating treatment was carried out without removing the cloth from the backing. The inside view. The most non-original parts on the chassis are the two tube shields on the left. 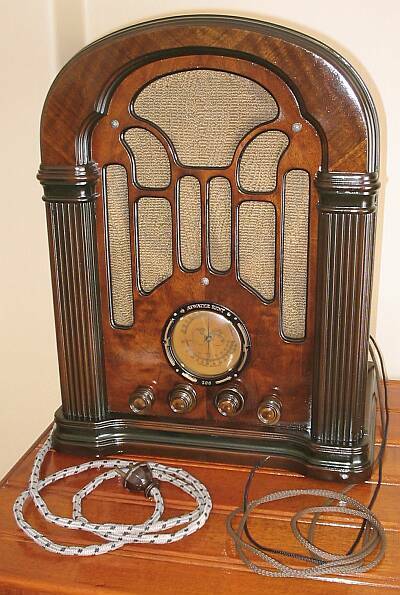 Unfortunately, this radio had only one of the original three golden tube shields left. So I used standard shields, straight out of Renato's stock, at least as a provisional solution until I find the originals, or make replicas. My new power transformer seems to be a tad larger than the original, but not enough to look out of place. The electrolytic capacitor on its left side is not nearly as long as the original, but considering that the original was no longer there, and that I had this capacitor, which fit the hole, had the correct capacitance and voltage ratings, and was in perfect condition, I used it. The triple electrolytic is still there, but totally dead, so it's disconnected. Small modern caps, well hidden under the chassis, do the work. I decided in favor of this solution, rather than cutting the old cap open and installing the new ones inside. That can always be done later, if the next restorer 70 years from now decides to do so. But turning back is not possible, after cutting that cap open. There are specks of rust on some places, and I did not redo the paint job on the speaker structure. So the radio does not look new. It looks like a reasonably well treated 70 year old radio inside. The chassis has rust only where it has been deeply scratched. The rest is impressively shiny, a result of Atwater Kent's nickel-over-cadmium plating. On the outside, of course, the new finish is obvious. But considering the condition of the old one, there was no choice. 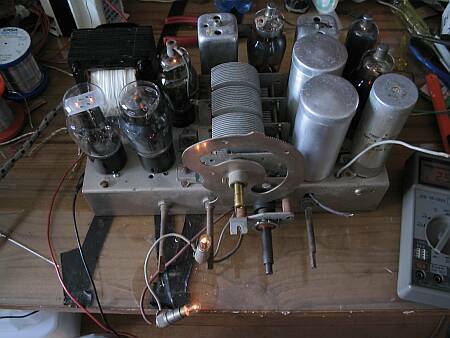 Restoring this piece of radio history was a long process. From the moment Alain got me this radio, two years passed with no activity other than gathering the parts and information needed for a good restoration, and thinking about how I would do each part of the process. And then, the actual work took every bit of my spare time for about four months! That's well over 300 hours of work, making this the most time-consuming restoration since I started this hobby. I don't regret it - any time spent working on an Atwater Kent radio is time well spent! My thanks go to Alain, his former landlord whose name I don't know, to Renato, Romelio, and everyone else who helped me getting parts, information, and courage to rescue this fine piece of radio history! If you want to use the beautiful face of the Atwater Kent 206 as a background image for Windows, or whatever, be my guest. You can click this photo to get a 1024x768 pixel version of it.